With the help of photo slideshow software from AMS Software, you can create real movies from pictures that depict different events, people or memories. By creating a video slideshow we are able to present our favorite photographs to friends and family. Photo Slideshow Creator is universal software that allows you to create video slideshows. This program comes with all the necessary tools to ensure the creation of professional quality video slideshows. Our software supports numerous devices, so feel free to create slideshows for your mobile phone, DVD, iPod, or upload to popular social media websites like Facebook, Myspace, and YouTube. To create your video slideshow after putting it together, please follow a few simple steps. First, select ”Create" at the top of your menu. Next, select "Create video slideshow". Look at the options, and choose the medium you wish to use for playing your slideshow. 1. AVI-video file. Slideshows converted to AVI-video can be watched on your computer, or sent via email. Photo Slideshow Creator lets you choose the codec for creating video slideshows: XviD, DivX, H.264.. Codecs are used to convert the data stream or signal for later use. The software will also allow you to adjust the parameters of your video and audio streams for greater control and video optimization. 2. HD video. 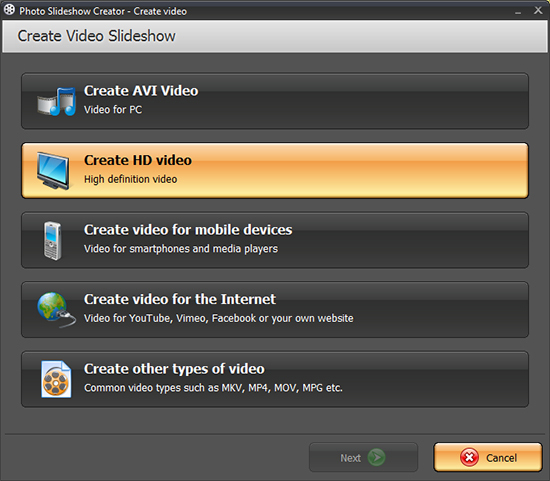 This option allows you to create video slideshows in High Definition. Using the HD format for video recording allows the user to achieve higher resolution and watch the video slideshow on modern wide screens. The conversion wizard allows you to save your HD slideshows in different resolution: Full HD 1080p 16:9 or HD Ready 720p 16:9. HD video is created by using the H.264 video codec. Note: H.264 is a modern codec designed for high compression of the video. This codec will allow you to create a high quality DVD photo slideshow movie. The codec is regarded as the best choice judging by most parameters. However, this codec is not supported by many computers, thus you might need to install the H.264 decoder on your computer before playing the video. 3. Create video slideshow for mobile devices. With our software you can create slideshow videos for different media players such as your iPad, iPhone, iPod, smartphones, or PSP. We use MPEG4 and 3GP video compression for these devices. 4. Create video slideshow for Internet. With Photo Slideshow Creator you can create web-optimized video slideshows and post them on the Internet. Publish your video slideshow on popular video hosting sites and social media network such as: YouTube, Facebook, MySpace and others. Simply choose the website, and the conversion wizard will automatically create the video slideshow supported by this site. Note: Most of the internet portals support MPEG4 video compression, so if you created a video for YouTube, you can also upload that video on Facebook. 5. Create FLV video for your website. You will appreciate this feature if you have your own website or blog, and would like to be independent from Internet platforms and upload your slideshow movies being sure they are not removed from the server. Photo Slideshow Creator will generate a FLV file, HTML embed code, and a player. You will also receive instructions for embedding the movie to your webpage. The success of your DVD photo slideshow depends on the quality and richness of your photographs. The rest depends on your imagination and creativity. Use good music to enhance your viewer’s visual emotions, and transition effects to add the finishing touch. A good slideshow is one that is fun to watch.